The swimming pool at Wingspread (shown covered by a tarp in 2009) is an integral part of the grounds. It was filled with water, but was ornamental for many years, rather than being used, when it was drained after leaks were discovered more than 10 years ago. The pool is now being renovated, to be filled and again be a water feature of the house. The Johnsons would be moving more than five miles from their home on Racine’s south side, near the SC Johnson offices and factory, to their new home in Wind Point, beyond the city limits. Sam feared not seeing his friends anymore. He had no reason to worry: once his friends learned Sam’s new home had a swimming pool, they were anxious to bike out to visit him. The second anecdote was told by Edgar Tafel, the young apprentice who was in his mid-20s when Wright trusted him to supervise construction of the SC Johnson Administration Building and then of Wingspread. Tafel, one of the original Taliesin Fellowship apprentices (1932-1941) recalled agreeing to a change in the location of some plumbing for the pool in consultation with contractor Ben Wilteschek while Wright was in the Soviet Union. The work is expected to be completed late this year by Riley Construction, the general contractor. 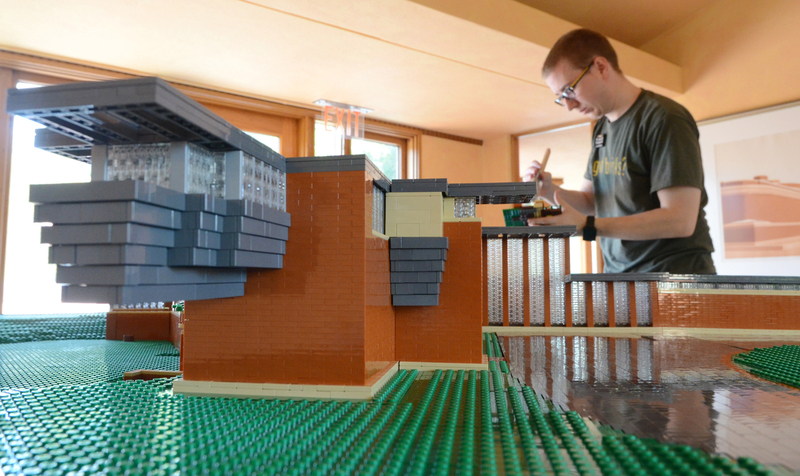 Signs guiding people to Frank Lloyd Wright public sites in Wisconsin, including Wingspread in Wind Point, north of Racine, are being placed in communities to guide motorists once they leave the Interstate highways which were marked with “Frank Lloyd Wright Trail” signs last fall. The signs resulted from a bipartisan bill signed by Gov. Scott Walker at Taliesin a year ago. The signs above are on I94, near Highway 20, top, and on Seventh Street, just east of City Hall in Racine. The sign on the long arm is installed at N. Main and Hamilton streets, north of downtown Racine, Friday April 21 by Jeff Hoffman, John Dirkintis, and Jon Hanson of the city public works department. Wisconsin Gov. Scott Walker is applauded after he signs the bipartisan bill to fund a Frank Lloyd Wright Heritage Trail between Racine and Richland Center, in Wright’s drafting room at Taliesin, his home in Spring Green, Monday March 21, 2016. Looking on are Rep. Cory Mason (D-Racine), left, State Sen. Howard Marklein (R- Spring Green), Rep. Todd Novak (R-Dodgeville), who introduced the bill, and State Sen. Van Wanggaard (R-Racine), a co-sponsor. These are three recent photos of windows at Wingspread, Taliesin, and the Hardy House. 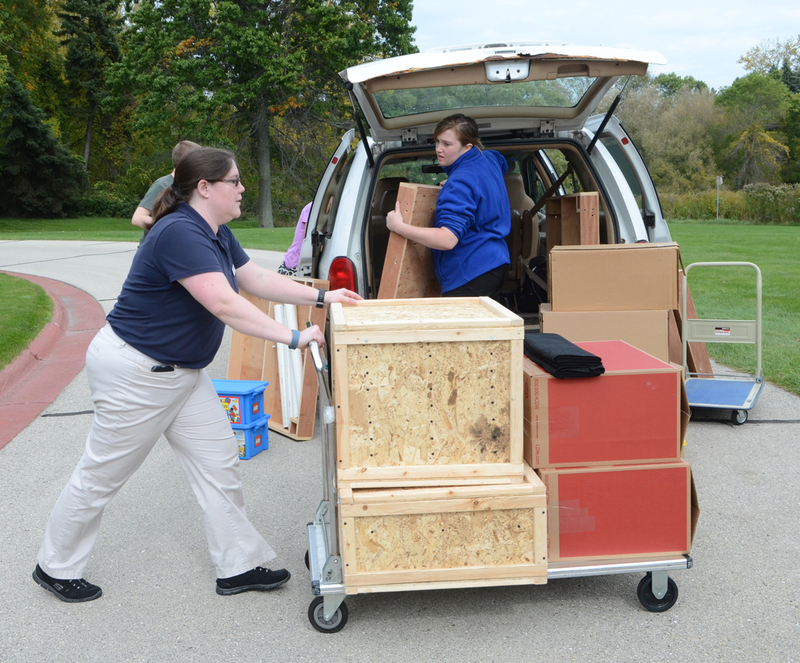 This is how Jameson Gagnepain’s adventure at Wingspread starts: unloading two custom-built wood crates and four cardboard boxes, all stuffed with about 50,000 LEGO bricks. 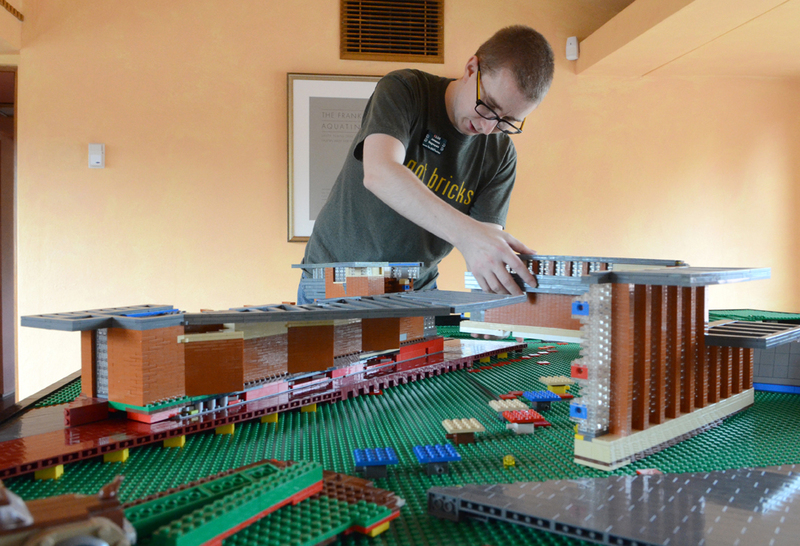 In two hours the bricks will have been reassembled into a model of Frank Lloyd Wright’s 14,000 sq. 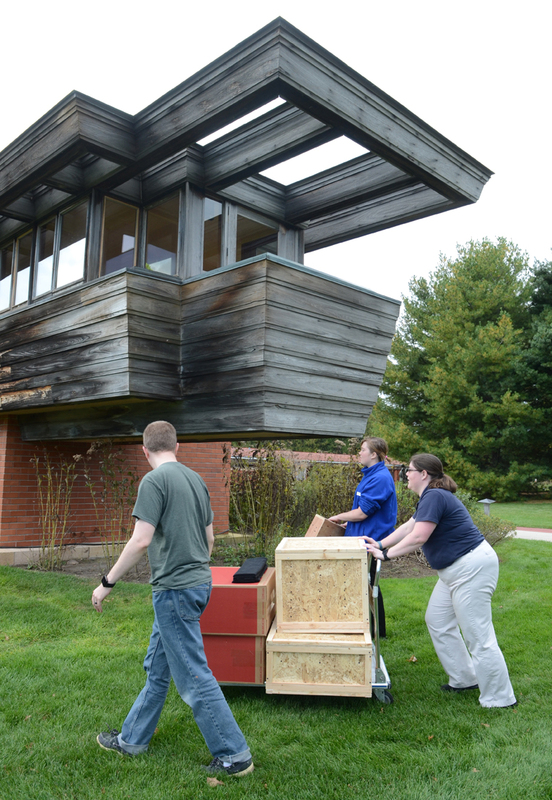 ft. home for Herbert F. Johnson, Jr., which will be displayed on the second floor of Wingspread probably into December. The model is stunning in its detail, the statistics -at the end of the story- are staggering. 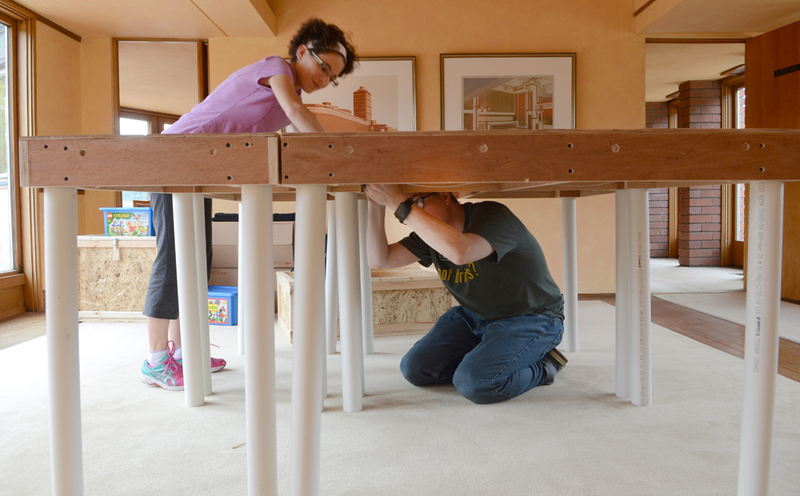 First, Gagnepain and his wife, Amy, assemble the five-foot square table the model will sit on. Gagnepain starts with a blank “canvas,” if you will, a broad expanse of green LEGOs representing the landscape around the house. 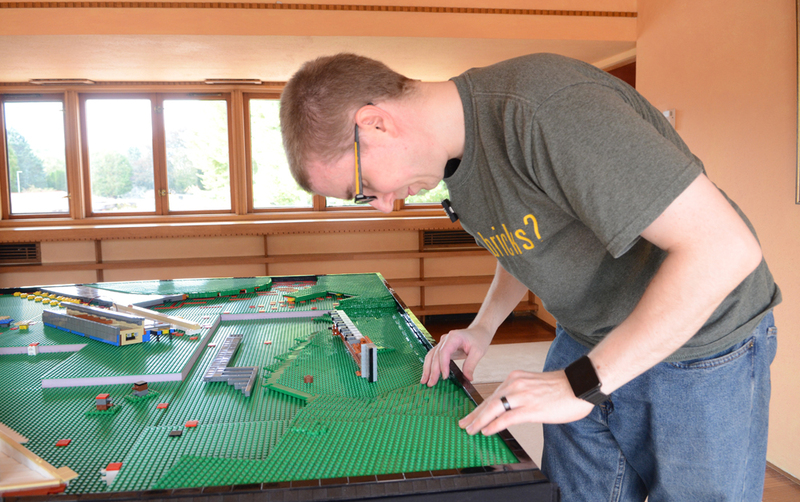 There is no hesitation as he spends the next two hours assembling the model of the house. 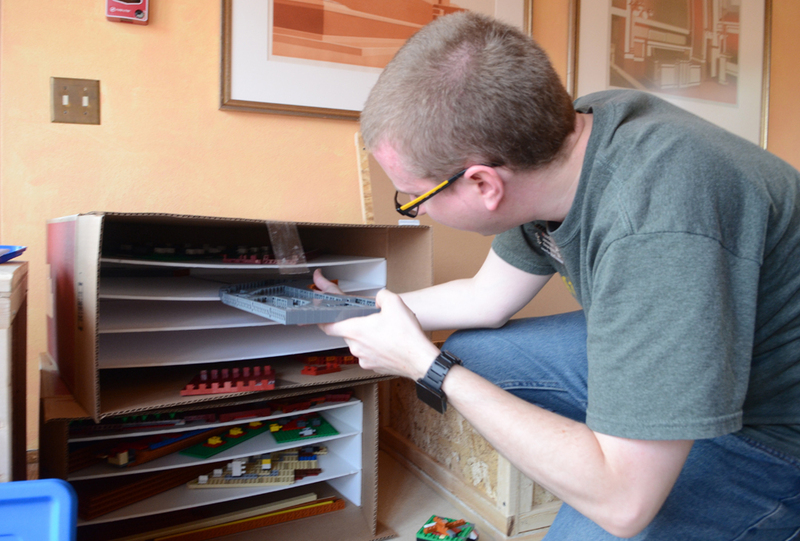 He works in IT for a medical supplies company, but LEGOs have been his passion since he was young. The colorful plastic bricks were his expected presents for as long as he can remember. 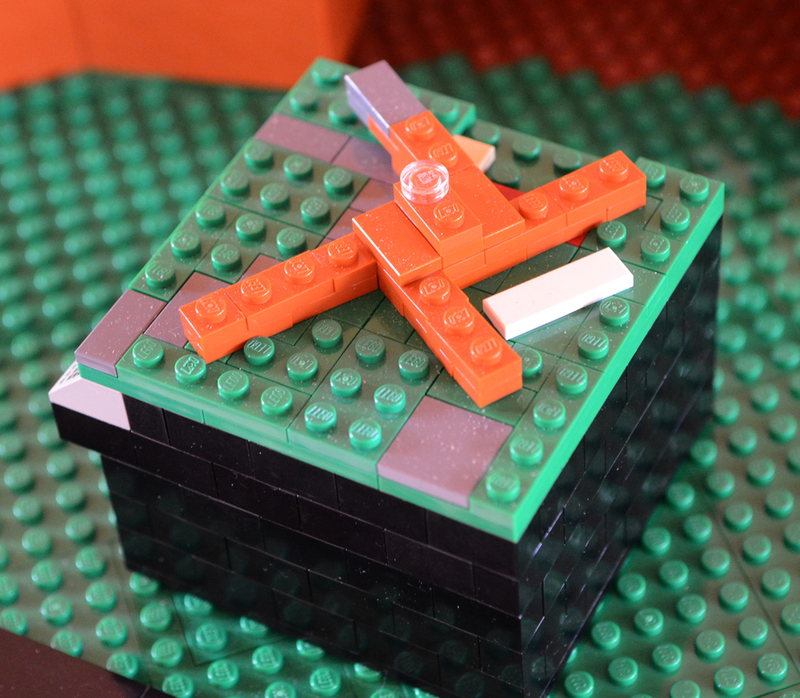 Amy is so understanding, he says, that she suggested their wedding have a LEGO theme. Gagnepain scoured the Internet for photos of what the house looked like when it was built, and then took notes during a visit to Wingspread. His biggest challenge was in fashioning daughter Karen Johnson’s cantilevered balcony at the north end of the house. “It took me ages to get right, getting the wood texture right. I built it three or four different ways. I got it right then dropped it and had to start over.” He says the playroom at the east end was another challenge because of the dearth of photos of what it originally looked like. 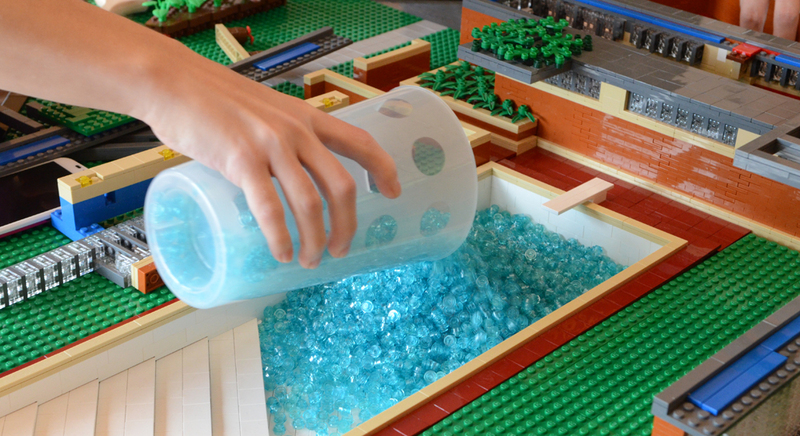 Amy pours tiny blue bricks into the swimming pool to simulate water. Gagnepain was careful to even show the different levels in the swimming pool. 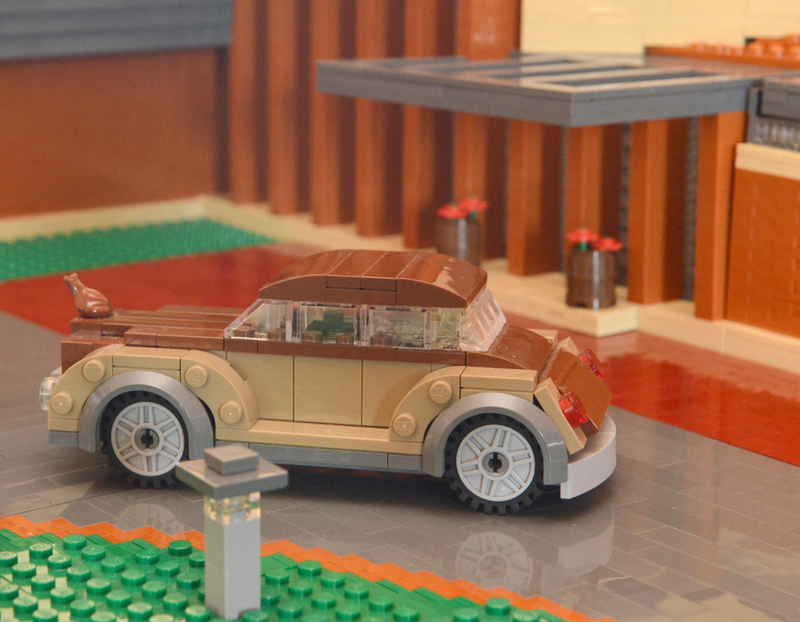 A LEGO car, which brings to mind a Mercedes sedan that Wright owned, is parked at the front door. 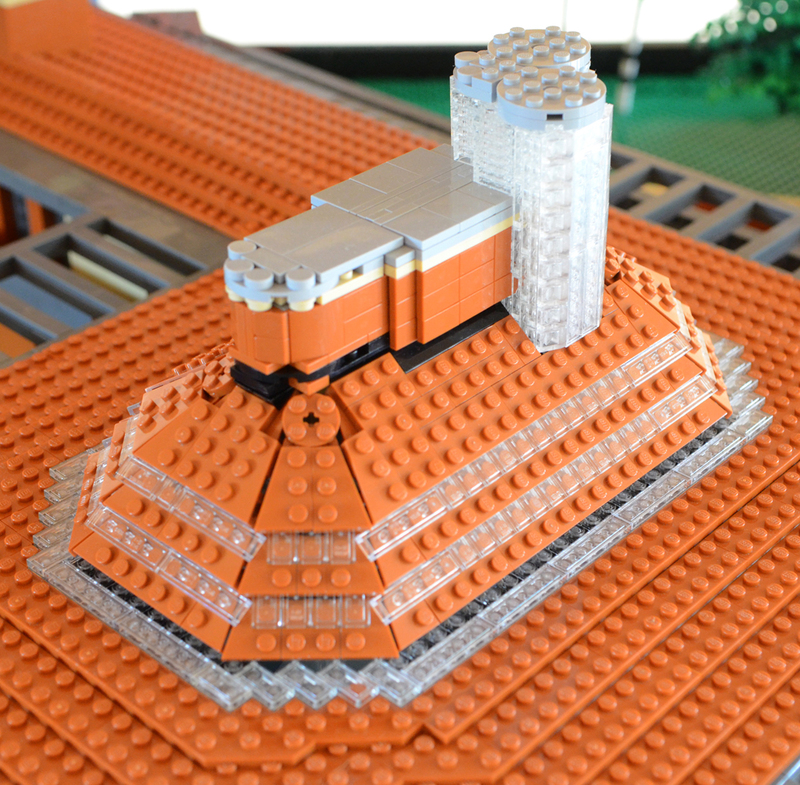 There is even a red Wright “signature tile.” As for the lack of a Frank Lloyd Wright figure, Gagnepain says he will make one as soon as there is a LEGO porkpie hat. 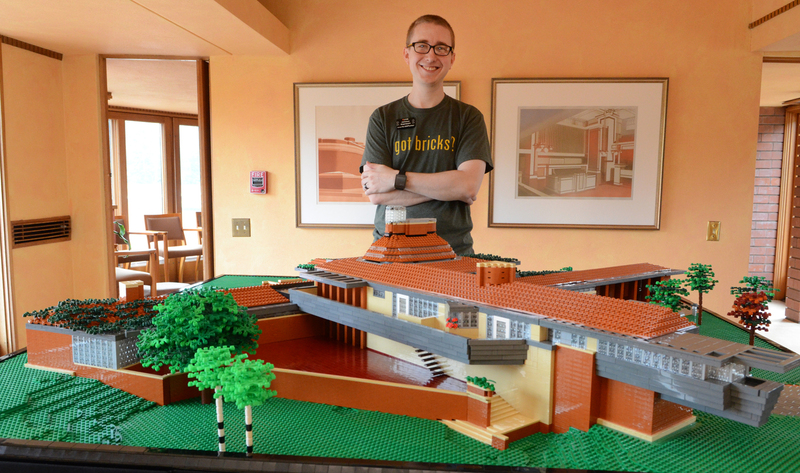 Gagnepain and the model are feature in Tom Alphin’s newly released book The LEGO Architect. 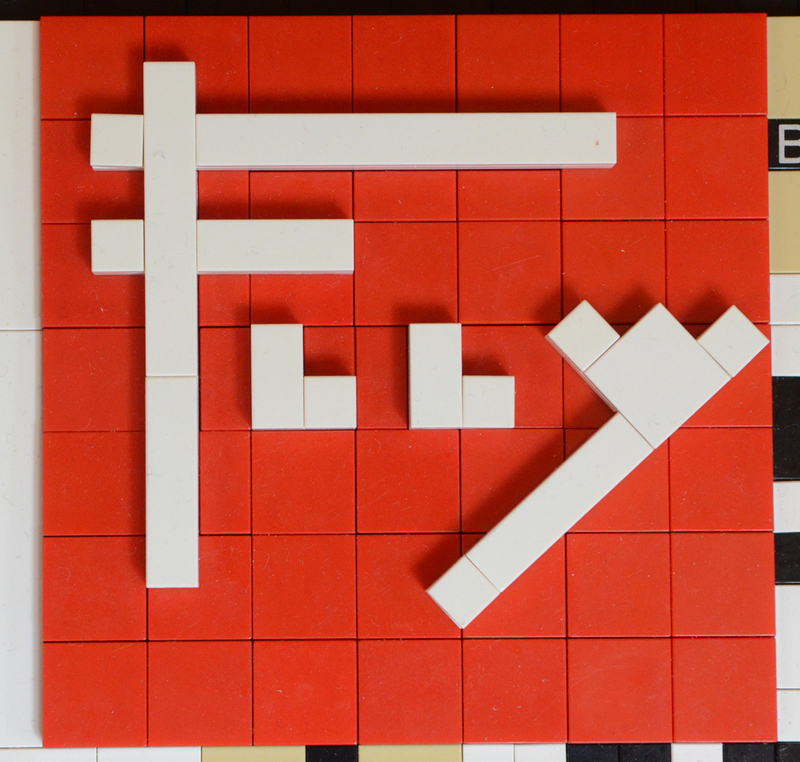 There are an estimated 50,000 LEGO bricks in an estimated 100 different shaped bricks. There are seven color in the building. Most of the home’s Cherokee red bricks are represented by about 10,000 “1×2 plate in Dark Orange” bricks. The grounds and foliage use the seven colors from the building as well as an additional eight colors. Edgar Tafel’s Carl and Marie Albert House is officially saved from the threat of demolition, capping an almost two-year legal case. The condition of the stone house, designed ca. 1949, deteriorated significantly after homeowner Joan Schulz left the house more than five years ago to care for a relative. Dishes were reportedly left in the sink. The roof leaked, and the abandoned house was filled with mold. 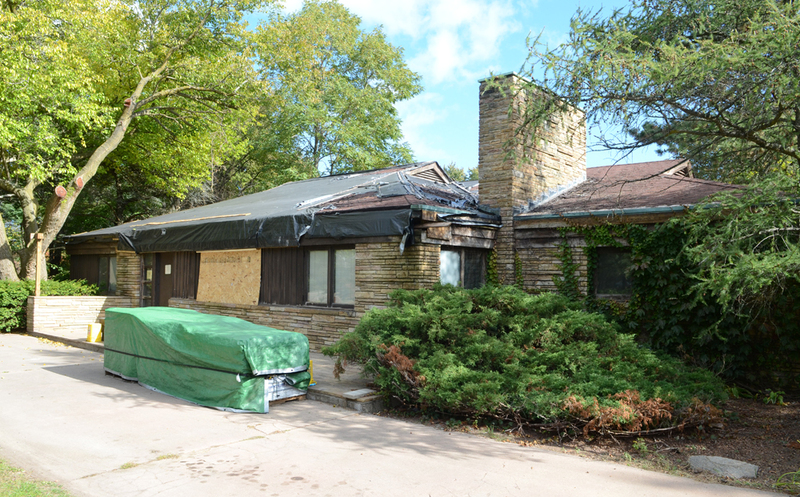 The Village of Wind Point, north of Racine, posted a sign declaring the house uninhabitable, and sought a raze order. The house, at the intersection of Four Mile Road and N. Main Street, is at a busy corner, and was an eyesore. Although Schulz and her sons were willing to rebuild the house, the village argued that because the cost of repairs exceeded the then-value of the house, it should be torn down. 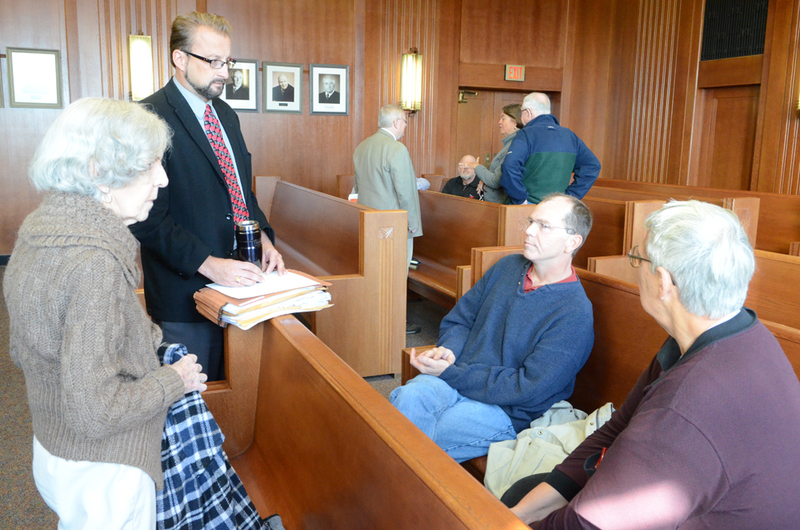 Village of Wind Point Attorney Ed Bruner, left, and Peter Ludwig, the Schulz’ attorney, confer before the court hearing. 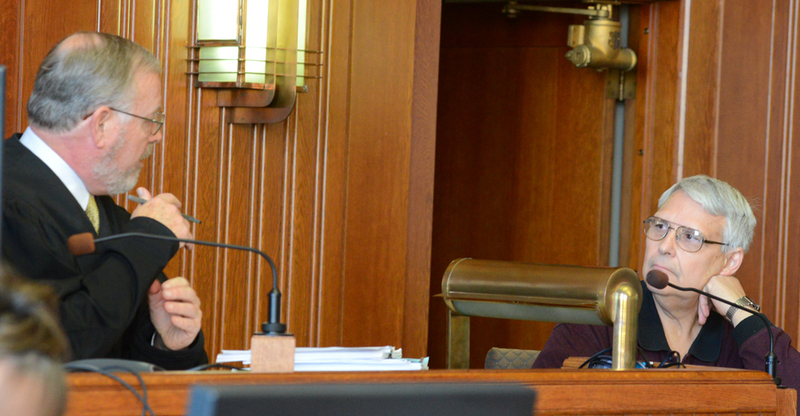 Bruner and Judge Faye Flancher pointed out that Schulz’ son, Linden Schulz, has been overseeing the repairs rather than Larry Ruka. Judge John Jude, who oversaw the case until the county’s judicial rotation in August, had appointed Ruka as construction manager. Ruka has not been on site since April. 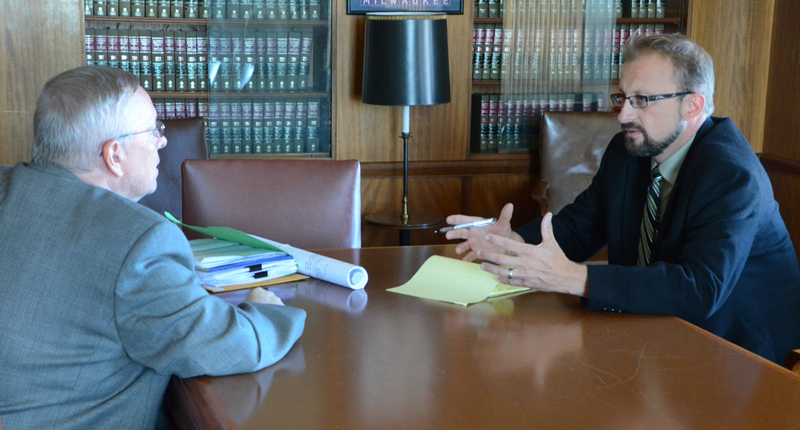 The Schulz’ attorney, Peter Ludwig, said that the house is “next in queue” for the electrician. 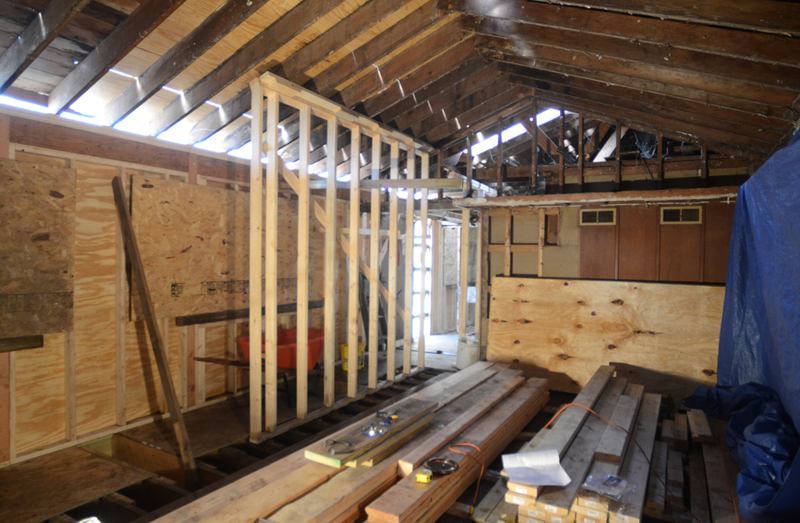 Once he finishes his work, plumbing fixtures can be reinstalled and insulation and drywalling will be done. 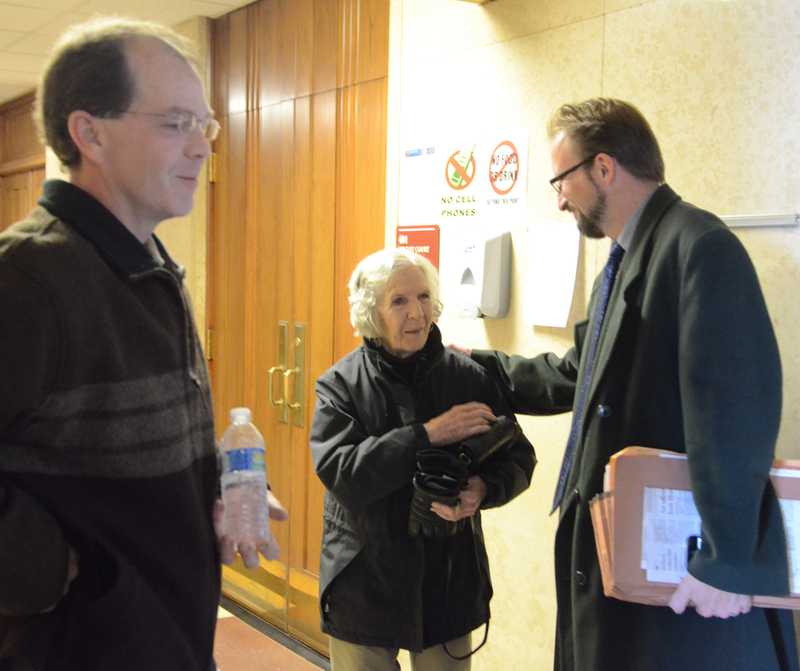 Joan Schulz, left, Ludwig, Linden Schulz, and Larry Ruka talk after the hearing. Edgar Tafel’s Carl and Marie Albert House got another reprieve from a raze order Wednesday in court in Racine. Joan Schulz had walked out of the house about seven years ago to care for a grandchild. The house deteriorated as it sat empty and neglected, eventually under a failed roof. The Village of Wind Point declared the house uninhabitable, and sought a raze order. Much of the front portion of the Albert House roof is still covered with plastic tarp Tuesday November 12, but Schulz’s attorney, Peter Ludwig, and structural engineer told Judge John Jude that 75% of the roof has been repaired. A temporary bracing, left of center, shows the extent of structural work that had to be done before the roof could be replaced. 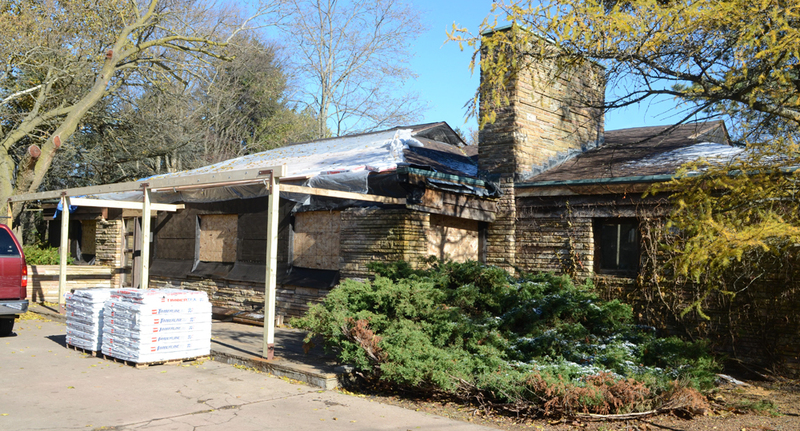 Although the Schulzes have not met court deadlines to complete the roof repair, Judge Jude decided Wednesday to let repairs continue, rather than order the house razed, provided that the roof, structural repairs, electrical and plumbing work are completed by December 20. He appointed Larry Ruka, the structural engineer hired by the Schulz family, as construction manager. Work had been supervised until then by Linden Schulz, one of Joan Schulz’ sons. Jude said he would manage the project with Ruka. 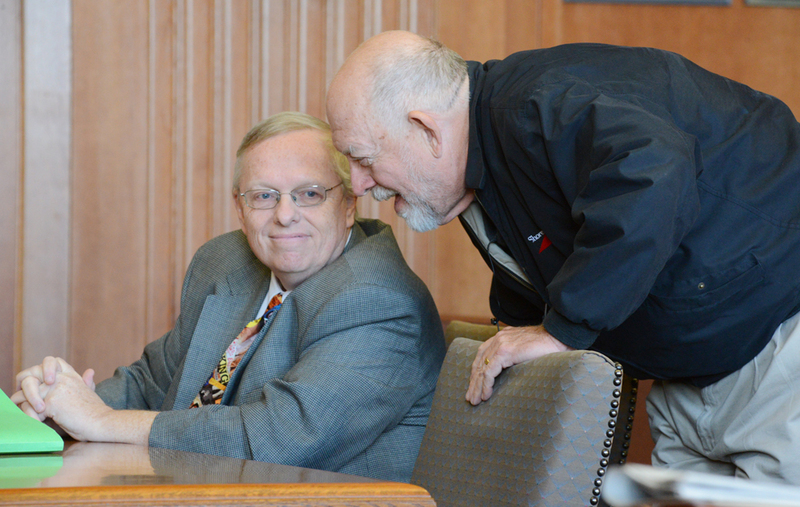 Village president Pete Christensen, right, consults with village attorney Ed Bruner during the hearing. Bruner asserted that “Speaking on behalf of 1800 Wind Point residents, when I drove past the house today, it looked worse than it did in may at initial hearing.” Ruka disagreed, as he did when Bruner asked, “From the village point of view, what it looks like now, frankly, looks abandoned, does it not?” Bruner referred to the plywood covering the windows openings, among other things. He was told the windows had to be removed to complete structural repairs. 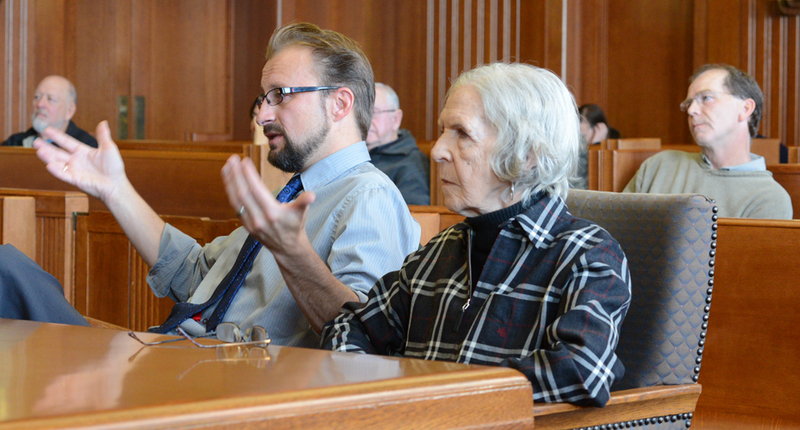 Linden Schulz, right, and Joan Schulz listen as Ludwig questions Ruka. 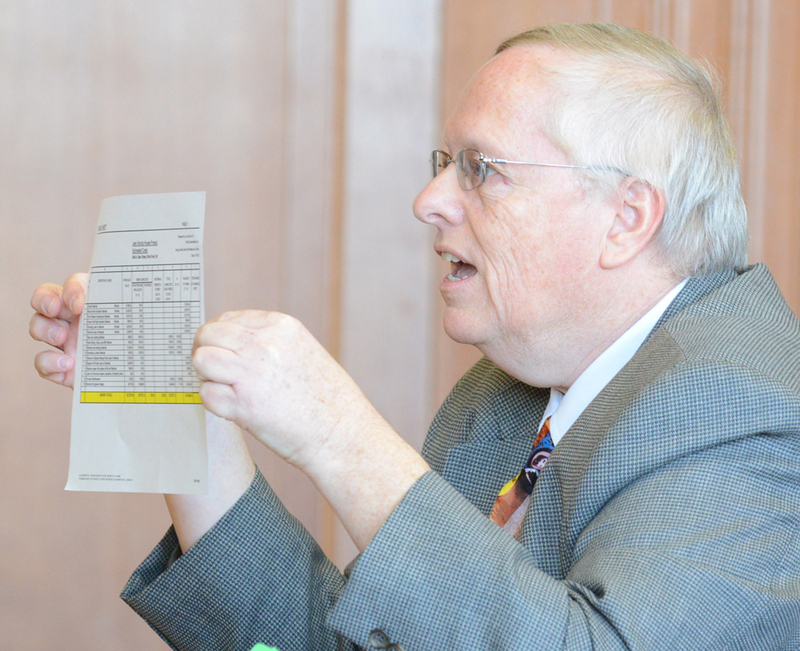 Holding Schulz’ cost estimates, Judge Jude appoints Ruka as construction manager of the project. 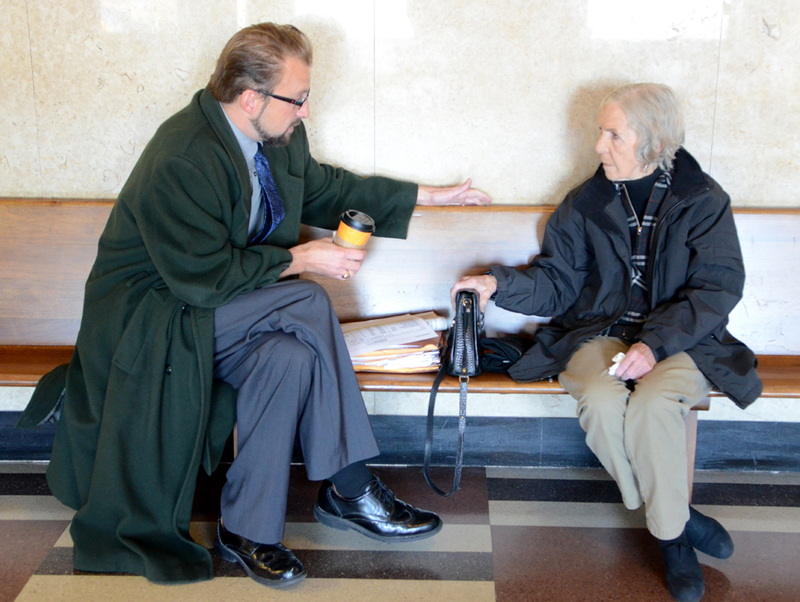 Ludwig reassures Joan Schulz as they leave the courtroom. Judge Jude was concerned about having the roof completed by October 30, before the onset of winter. Although the roof is not quite finished, and there was a bit of snow Monday, warm temperatures are forecast into next week. Ruka expects that the roof will be finished in a few days. 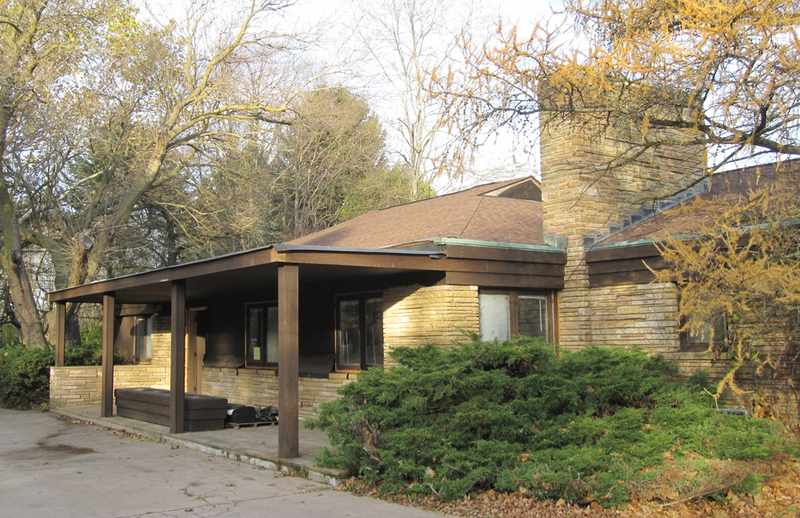 The Carl and Marie Albert House, which was designed by Edgar Tafel, got a reprieve from a possible raze order when today’s court status hearing was postponed until November 13. 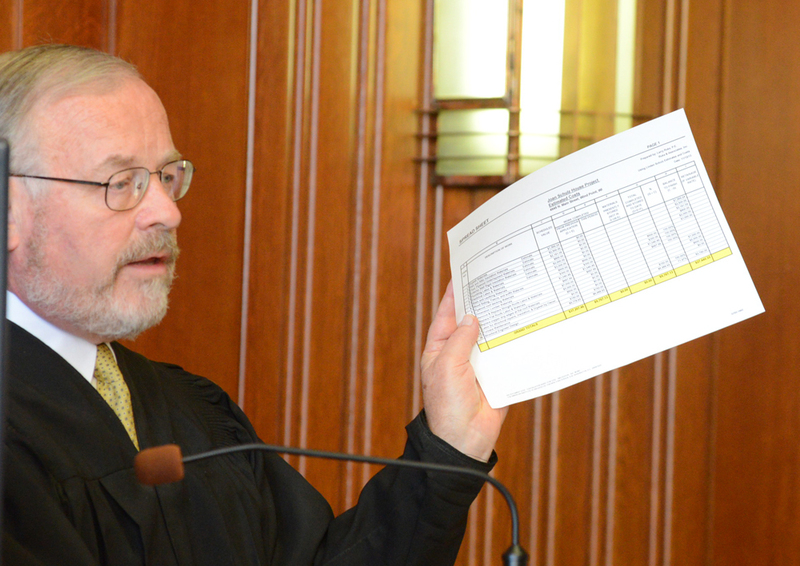 Judge John Jude had indicated in September that he wanted a new roof on the house by today’s court hearing, to ensure the work would be done before winter. Although significant structural progress has apparently been made, roof work has not begun. Linden Schulz, the son of Joan Schulz, the homeowner, has a signed contract from a roofing contractor. He wrote me today in an email that he expects the roofers to begin work next Tuesday. He anticipates they will be done by the 13th. “That (the completed roof) is the primary thing the judge wanted to see,” says Ed Bruner, attorney for the Village of Wind Point. Both sides in the dispute agreed to reschedule today’s hearing. 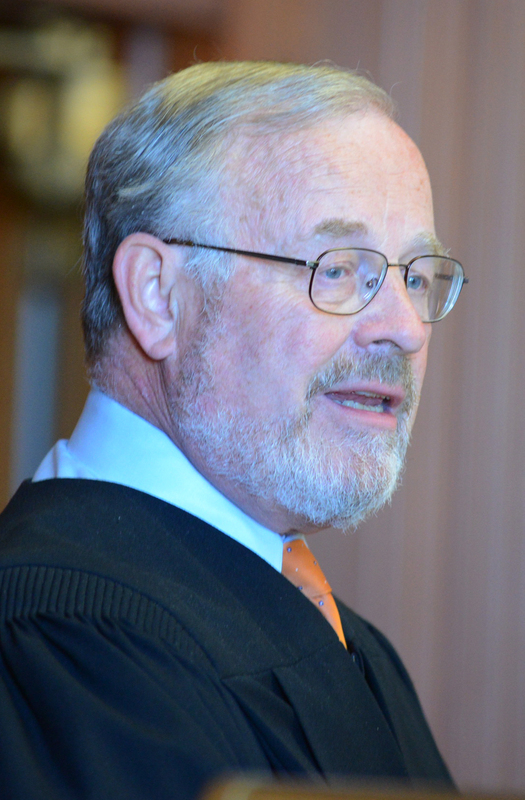 Judge John S. Jude continued his stay of the raze order for Edgar Tafel’s Carl Albert House in Wind Point (Racine), Wis., after a two-hour evidentiary hearing in Racine County Circuit Court Friday September 13, 2013. 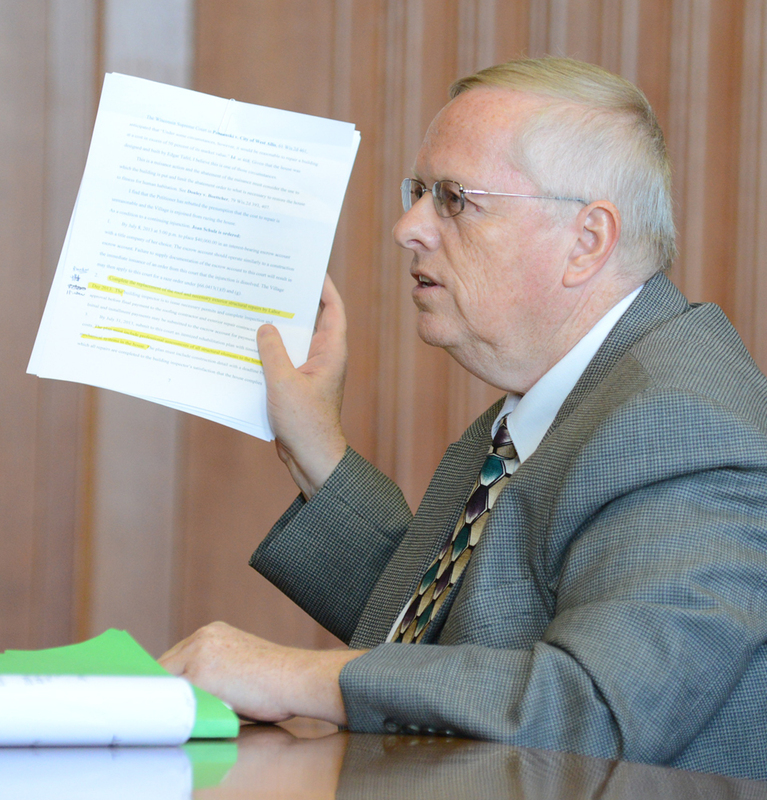 Linden Schulz, the son of Joan Schulz, who owns the house, was closely questioned why he had not met deadlines set at a June court hearing for having a professional structural assessment of the house completed, and having the roof repaired. 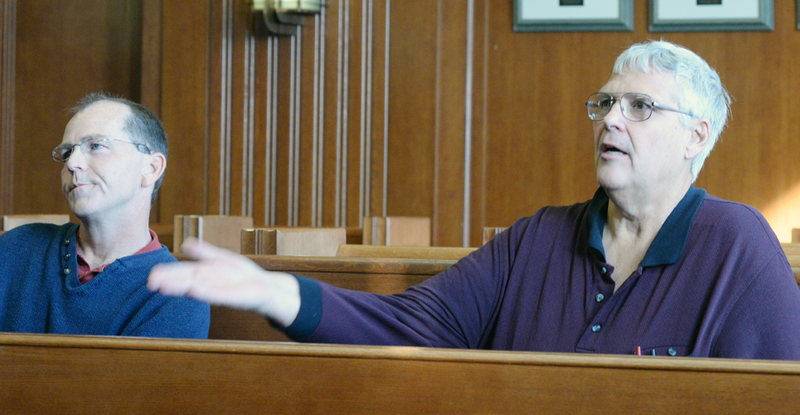 Judge Jude said, as he ruled, “My goal is to save the house, but I still have great reservations whether it is feasible.” The next court hearing was scheduled for October 30. Judge Jude will likely order the house razed then if structural repairs have not been completed, and if the house has not been re-roofed. 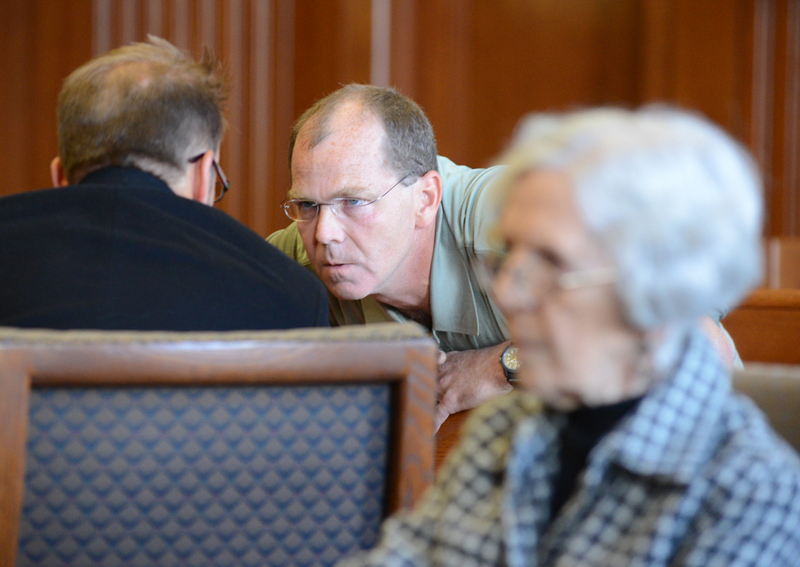 Joan Schulz, right, listens to testimony as her attorney Peter Ludwig, left, consults with her son, Linden Schulz. Ed Bruner, representing the Village of Wind Point, asks Linden Schulz why he has not complied with provisions of a previous court order. 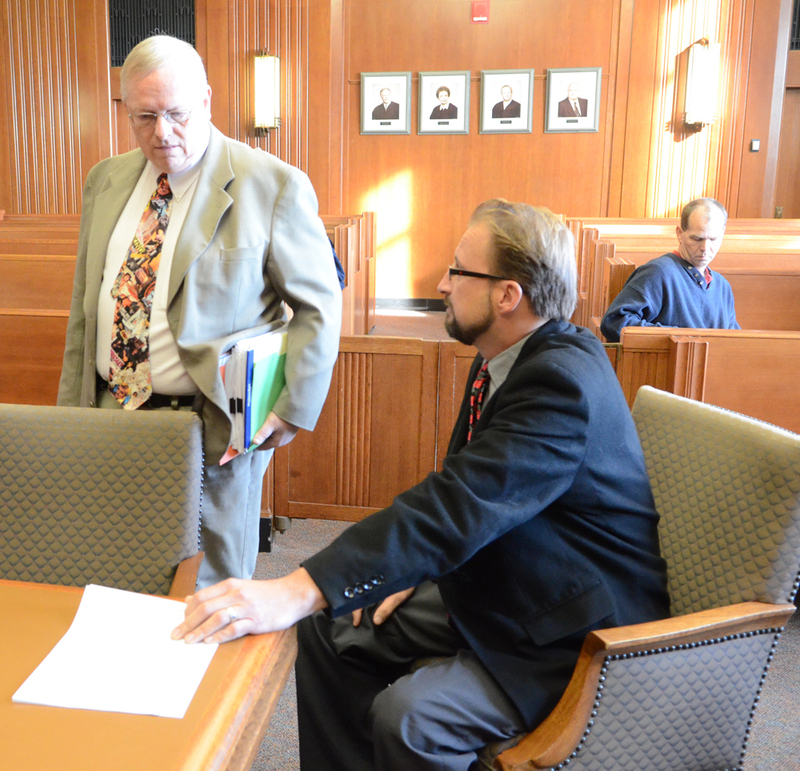 Attorneys Ed Bruner, representing the Village of Wind Point, left, and Peter Ludwig, representing the Schulz family, meet after the conclusion of the hearing.